In December we had the pleasure of being hired to do a multi-floor installation out in Howard Lake, Minnesota. These floors all had their particular challenges but we met those challenges and were able to provide the amazing results people have come to expect from Great Garage Floors! 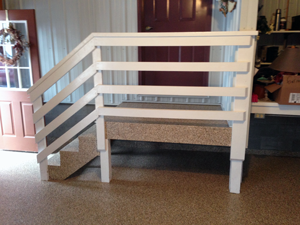 The first install was a typical garage with a less typical large set of steps. Our client wanted the steps coated in a particular way to compliment the floor installation and make the steps and landing more durable and easy to clean and maintain. Our well experienced crew was able to coat specific surfaces and elevations to make the steps look fabulous without being over the top. The steps turned out gorgeous and the client was thrilled. The second install was clubhouse/office. 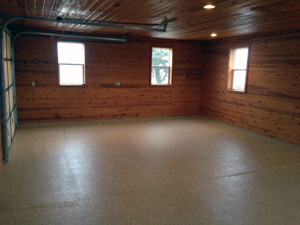 A nice finished heated out building to be used as an office just needed a new floor to complete the picture. The challenges of this room were related to a band of lower concrete all along the perimeter of the interior walls and a wood border that stood out in some areas. We were able to fill in the lower concrete areas and level them off making the floor a nice even elevation around the borders. We were also able to coat the wood strips helping them to blend in and making the floor look sharp and attractive! The third install was a reclaimed barn and milk room. No longer being utilized for farming, this barn had the floor troughs filled in and smoothed out. Our client desired to use the barn as a workshop and wanted nice floors to not only look great but be easy to keep clean. After our epoxy flake floor installation he has exactly what he wants and can’t wait to move into it. The old milk room had it’s own challenges, being in exceptionally poor condition. We were able to patch and smooth the floor and create a beautiful look and a more functional room to use. We love doing multi-floor installation projects and are happy to work with our clients to give them exactly what they want.